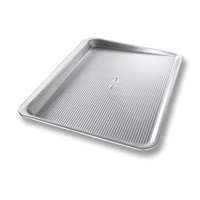 Heavy-duty pans made in Pittsburgh that facilitate professional, even baking. Create flawless homemade cookies, pizza, cakes, French fries or muffins for your friends and family! 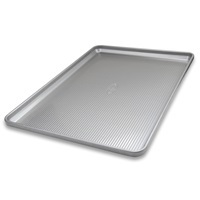 With an extra large surface, the USA PAN Extra Large Sheet Pan is the ideal size for home bakers looking for maximum surface area when baking large batches of cookies and other baked items for friends and family. Our proprietary Americoat® nonstick coating provides quick and effortless food release, flawless baked goods and easy clean-up. 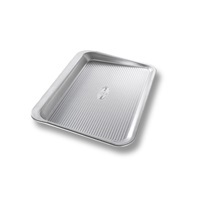 The USA PAN Small Cookie Sheet is perfect for evenly baking golden brown chocolate chip cookies to share with friends and family. Our proprietary AMERICOAT® nonstick coating provides quick and effortless food release, flawless baked goods and easy clean-up. Featuring an innovative scoop design and a tapered edge, The USA PAN Small Cookie Tray Pan is perfect for evenly baking classic chocolate chip cookies to share with friends and family. Home bakers can simply slide finished cookies onto a kitchen counter or cooling rack. Our proprietary AMERICOAT® nonstick coating provides quick and effortless food release, flawless baked goods and easy clean-up. 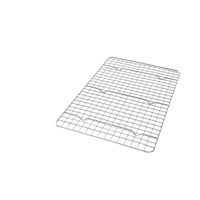 The USA PAN Medium Cookie Sheet is the perfect size for bakers looking to pack on a few extra sugar cookies on to a medium-sized sheet! 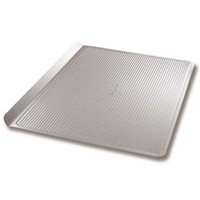 The USA PAN Medium Cookie Sheet is perfect for evenly baking golden brown chocolate chip cookies to share with friends and family. Our proprietary AMERICOAT® nonstick coating provides quick and effortless food release, flawless baked goods and easy clean-up. With a technologically advanced scoop design home bakers can simply slide finished cookies onto a kitchen counter or cooling rack with the USA PAN Medium Cookie Tray Pan. Our proprietary AMERICOAT® nonstick coating provides quick and effortless food release, flawless baked goods and easy clean-up. 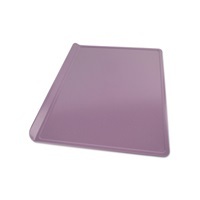 The USA PAN Large Cookie Sheet is perfect for evenly baking sugar cookies to share with friends and family. Our patented AMERICOAT® nonstick coating provides quick and effortless food release, flawless baked goods and easy clean-up. 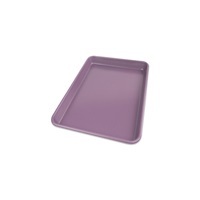 The USA PAN Large Cookie Tray Pan is perfect for evenly baking large servings of cookies to share with friends and family. Featuring an innovative scoop design and a tapered edge, home bakers can simply slide finished cookies onto a kitchen counter or cooling rack. Our proprietary AMERICOAT® nonstick coating provides quick and effortless food release, flawless baked goods and easy clean-up. 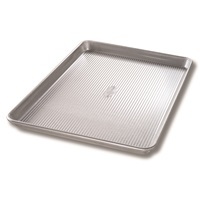 The USA PAN Quarter Sheet Pan is the perfect size for bakers looking to create flawless homemade cookies, brownies, and bread rolls for friends and family! Our proprietary AMERICOAT® nonstick coating provides quick and effortless food release, flawless baked goods and easy clean-up. 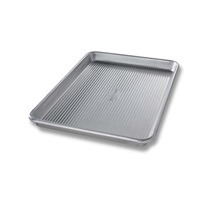 The USA PAN Jelly Roll Pan is perfect for evenly baking cookies, jelly rolls, french fries, or baked veggies to share with friends and family. Our proprietary AMERICOAT® nonstick coating provides quick and effortless food release, flawless baked goods and easy clean-up. 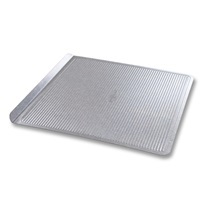 The USA PAN Half Sheet has a nonstick finish that easily releases cookies, vegetables, biscuits, and more. Our proprietary Americoat® nonstick coating provides quick and effortless food release, flawless baked goods and easy clean-up. 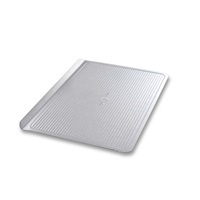 The USA PAN Heavy Duty Half Sheet has a nonstick finish that easily releases cookies, vegetables, biscuits, and more. Our proprietary AMERICOAT® nonstick coating provides quick and effortless food release, flawless baked goods and easy clean-up. 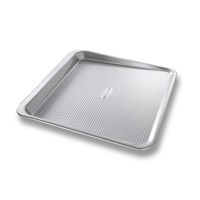 The USA PAN Heavy Duty XL Sheet Pan has a nonstick finish that easily releases cookies, vegetables, biscuits, and more. Our proprietary AMERICOAT® nonstick coating provides quick and effortless food release, flawless baked goods and easy clean-up. 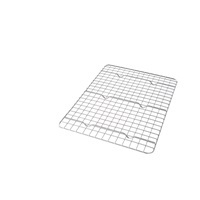 The USA PAN Nonstick Quarter Sheet Pan Cooling Rack set is the perfect accessory for home bakers looking to make freshly baked cookies, cakes, and scones that bake evenly, cool uniformly, and come out tasting great. 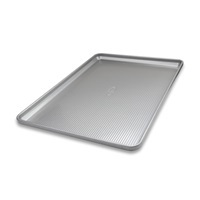 The USA PAN Nonstick Jelly Roll Pan bakeable Cooling Rack is the perfect accessory for home bakers looking to make freshly baked cookies, cakes, and scones that bake evenly, cool uniformly, and come out tasting great. The USA PAN Nonstick Half Sheet Pan Cooling Rack is the perfect accessory for home bakers looking to make freshly baked cookies, cakes, and scones that bake evenly, cool uniformly, and come out tasting great. 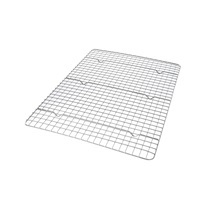 The USA PAN Nonstick XL Sheet Pan Cooling Rack is the perfect accessory for home bakers looking to make freshly baked cookies, cakes, and scones that bake evenly, cool uniformly, and come out tasting great. 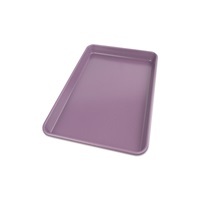 USA PAN's Purple allergy ID bakeware provides an easy solution to prevent cross contamination in the home. 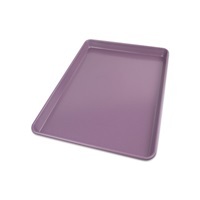 Whether cooking for your family or preparing foods to be shared in a school or community setting everyone can feel comfortable using the allergy free bakeware.